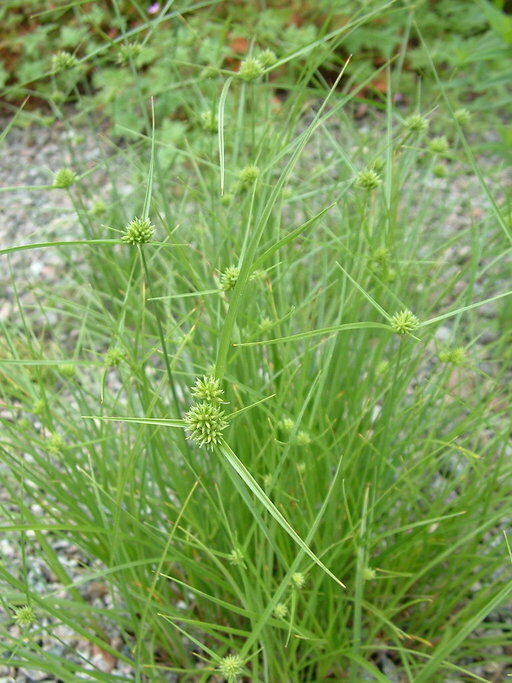 Cyperus lupulinus.Louis M. Landry.calphotos.berkeley.edu (Accessed 4/2014). Cyperus lupulinus is a perennial C4 sedge (Li et al. 1999), 10-50 cm tall from knotty rhizomes, stems wiry, smooth. Leaves 0.1-0.3 cm wide, gray-green, margins rough, shorter than flowering stems. Flower spikelets with 2-16 flowers, dull green to reddish-brown, crowded, radiating outward, flat, 0.3-0.4 cm wide, scales soon deciduous, spikelet axis not winged; inflorescence bracts 2-4, inflorescence mostly solitary, rounded, stalkless, at top of stem. Fruit an achene 3-sided, about 0.2 cm long; blooms and fruits Aug.-Oct.
Habitat: Dry, rocky or sandy soil, open woods or fields.